When it comes to personal care, data is everything. Doctors need medical history to work off of, and you need a trend of behavior to properly plan out your healthy future. It’s as simple as that, but what isn’t simple is gathering that data. We’ve investigated the best smart scales on the market, taking app compatibility and user-friendly designs into consideration. It’s time to step on the scale, and walk away with more than a single three-digit number. With a digital body scale, you can walk away with knowledge on how to change your routine, devise what is and isn’t working, and become a healthier you every single day. Let’s get into the best smart scales. From price to power, Eufy came out on top, but not without issue. First and foremost, we admire the wide weight capacity range and the way the tempered glass is extremely easy to clean and keep clean. The Bluetooth function has a good enough range, but this body composition scale is known to have inaccuracies if you don’t regularly calibrate it. The app tracks information well (if left open), but has advertisements and a short list of what it can connect to. 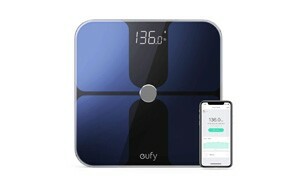 Eufy does give you a 15-month warranty, but based on our experiences, if you’re able to calibrate properly even after a week of use, your Eufy scale should last you for a long time. Check out our guide to the best luggage scales for more great products like this. We all know FitBit and the movement they caused. They put that same quality and reliability into the Aria 2, a sequel product to their widely successful Aria 1 model. The main downside to this is that FitBit doesn’t have the best customer support. Long waits, vague answers, and they are sometimes required to help you through the setup. Their app is extremely versatile and showcases the FitBit attention to quality, giving you plenty of information and analytics into your health. 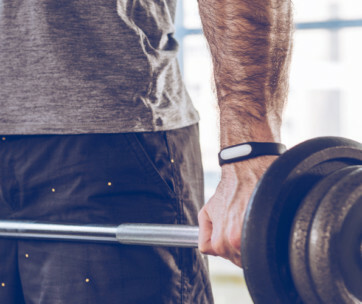 While the 400 lb weight capacity of Fitbit Aria 2 is nice, you might spend a moment or two getting it to connect with each use. The connection is weak, but beyond that, the power and hype are real. Two great companies clash for one stellar product. 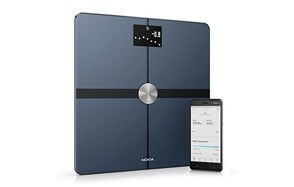 Nokia and Withings created this highly durable smart bathroom scale, one that comes with an aesthetic look, and thin build for easy storage. They give you up to 300 lbs of weight capacity, which is significantly lower than the competition. If you fall under that limit, you’ll be able to use the full-fledged app to track your information and biometrics with ease. Simple graphs, easy to read information, and a long-lasting battery to keep everything running smoothly. While Withings and Nokia Body+ looks nice, you’ll have to fight to keep it that way. The tempered glass top is extremely susceptible to spotting and picking up debris from your feet, so clean it well. Between the powerful connectivity, international weight display function and the bright LCD screen, you’ll have everything you need. 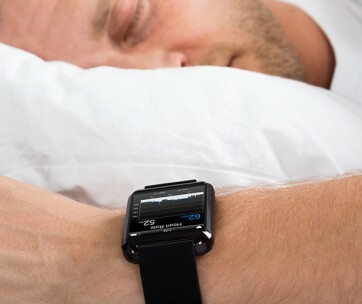 Check out our guide to the best sleep trackers for more great products like this. We always say that getting in shape doesn’t have to be expensive. Our top value gives you the most bang for your buck, if you can undergo a little bit of patience in getting to where you need to be. RENPHO syncs up to your Google Fit account, Apple Health, and a myriad of other apps that usually don’t hook up to body composition scales properly. 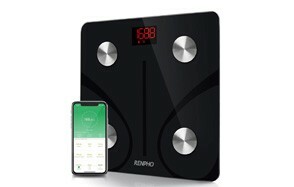 Our favorite feature is that if you want to just weigh yourself, RENPHO will hold onto the remaining BMI data and ship it to your phone next time it’s connected. It showcases 11 different BMI metrics to give you a full health card, but be warned that its range is very limited. If you’re standing within a few feet of it, you’re good to go, but outside the room and it’s not going to work. Our only other complaint was that you can’t have multiple user profiles, but the wide range of supported devices and decent battery time more than make up for it. Make sure you also check our guide to the best bathroom scales. We know Garmin as one of the top brands for fishing, hiking and staying fit in the great outdoors. Now they’ve taken the fight for fitness inside, and the results are astounding. For one, you get to connect to your Garmin account right off rip, so you won’t be left with a length setup. The bad news? It has a long list of devices and software that it’s not compatible with. Garmin gives you a full health card with an advanced biometric detection system, but for the money spent, their display (while it is super bright) is sorely lacking on aesthetics. It looks like you’re waiting for the bus at an out-of-date T station. But the proof is in the pudding, and between the durable tempered glass top and the 400 lb weight limit, Garmin Index Smart Scale holds up. If you like the brand, check out our guide to the best Garmin watches. First of all, we have to applaud their epic brand name. Greater Goods provides a top-notch Bluetooth scale at a rock-bottom price. They don’t just push out a product; they continue to work on it. If you’ve seen this scale before, you’ll be happy to know that it is now compatible with Apple Health, Google Fit, and many similar apps. You get a very bright LED display, high weight capacity, and our favorite benefit: forgetful phone forgiveness. If your phone’s not on you, it’ll retain that data and sync it next time you’re hooked up. With all that power, it does burn through batteries faster than we ever would have imagined. As a result of it using so much power, it has to be recalibrated frequently to maintain accurate readings. Greater Goods did quash one major complaint we find with most smart scales, and that’s range. Their Bluetooth 4.0 maintains a steady connection, no matter what. Polar have given FitBit a run for their money in recent years, and good on them for doing so. This stellar Polar Balance smart scale offers you a complete BMI report without having to go the extra mile and displays properly on the Polar app. You’ll even be able to sync these results with your Polar fitness tracker and give yourself a more rounded health card. Now it does run into some issues with the app not being super compatible, as it excludes some devices and software. Apart from that, while it displays accurately, you will run into issues with the calibration. You’ll need to check it frequently to ensure your results are on-point. With those little quirks aside, you’ll get up to 385 lbs of weight resistance on this, as well as a durable tempered glass top plate. Yunmai recently became compatible with all of your favorite apps, including Google, Apple and Samsung fitness tracking apps. You’ll be able to use this scale up to 400 lbs, and regardless of your weight, it’s precise within a quarter pound of measurement, right out of the box. Unlike most other scales, with Yunmai PRemium Smart Scale you don’t have to calibrate this constantly. It doesn’t come without flaws, however. You can track ten different body stats with this, but the body fat percentage indicator is wildly inaccurate and should be taken with a grain of salt, while the other nine work perfectly fine. With that, it goes through batteries like there’s no tomorrow, so be certain to stock up. If it’s just not a good fit for you, utilize your thirty-day return window and exchange it, hassle-free with Yunmai’s excellent customer service. QardioBase 2 took all the pros from their first model and made it into something truly fantastic. You get an extra high weight limit on this, as well as a mode to track your weight through pregnancy, split up into each trimester. We’re not crazy about how it displays the weight on the LCD screen because it’s right between your feet and not easily visible. Whether your weight fluctuates or not, you’ll have to calibrate this about once a week to ensure its accuracy. QardioBase gives you a complete BMI report, including water weight, body fat, and more. Sync it up to your Google Fit, Apple Health, or just about any fitness app that you use to store your data. QardioBase makes it easy right out of the box. Automatic BMI calculation based on body fat, water weight, etc. It’s not just about weight; iHealth Core is a full-fledged body composition scale for a complete health card. This gets you as close to your accurate body results without a DEXA scan. Our favorite feature is that it has so much internal memory, it will retain up to 200 recent scans, and just put them into your phone when you connect. That’s useful, especially if you or any of the other nine user profiles forget their phones. iHealth made a great product, but between the short battery life and the poor customer service skills, we couldn’t rank them higher. If you’re still not certain what you want in a smart scale, check out the buying guide below for more information. Full body composition including BMI, body fat, muscle mass, etc. Brand - When you’re dealing with electronics, brands matter. They tend to be a signal of quality, and if that quality fails, their reputation will dictate how they’re going to assist you through customer support. Reviews - User reviews are the beacon of hope in this landscape (well, Gear Hungry is, but you know what we mean). We pore over numerous user reviews before compiling our shortlist, and actually ordering and then testing these products. Ease-of-Use - Quick turn-on times, and a fast, simple app interface. For most smart scales, you’ll have to fire it up and let it stay on near your scale to gather data. A fast connection and simple data charts are what you should be looking for. Price - While it’s an item for your home health monitoring, we’d be foolish to say that price doesn’t majorly factor into a purchase like this. Smart scales have become affordable in recent months, just keep an eye out for weight limits and app usage so you know what you’re really paying for. Connectivity - We’ll discuss the differences between Wi-Fi and Bluetooth in a moment, but either way, you just want solid connectivity with a decent range. Most smart scales can connect to your phone within ten feet or more, which is really all you need considering how close you’ll be to the scale during data retrieval. Biometrics - This will come into play in the app. Biometrics refers to a full health card consisting of height, weight, and BMI, as well as blood pressure. If you’re using a smart scale to help you monitor your home health, you’re using a form of biometrics. When you get into full body scanners, that’s when it becomes more involved. Accuracy - This really is the entire point, and it comes down to the quality of the sensors being used. These sensors will rest beneath the top plate material (most likely tempered glass) and should be accurate within two pounds. You may be required to recalibrate from time to time. Display - You’ll usually see an LCD display, which is good. On occasion, you’ll find some smart scales with an LED screen, which can be a bit harsh on your eyes if you‘re weighing yourself first thing in the morning. Features - These usually refer to the app. Additional features might be exporting information into a PDF or Microsoft Excel file to make them more easily accessible, or being compatible with Apple Health (one of the most common health monitoring services online). They’re both just forms of connection, but there are a few differences. For instance, Bluetooth can’t connect to the internet, so you won’t find yourself connecting your scale to an online app that isn’t on your phone. It can’t go straight to the web. Wi-Fi focuses on internet connection, whereas Bluetooth is data exchange between two or more devices. It’s all local, so you can’t use Bluetooth to send any data to the internet. It sends information from your scale to your phone, which is enabled with Bluetooth and Wi-Fi. In short, it doesn’t matter what connection type you get for your scale; they’re both great choices. Q: What are Smart Scales? A: Smart scales are more than just a measurement of weight, they’re a way to track your overall health. Their non-invasive ways to build a trending chart, much like your doctor would have, regarding your weight over time. Smart scales send information to an app on your phone, and that app tracks the data and shows you varying statistics based on the feedback. Smart scales still display your weight on an LCD screen for you to see, but with the added benefit of the app. Most of these will connect via Bluetooth 4.0 or 4.1, though some can use Wi-Fi to connect to your phone and central internet more easily. Q: Should I Use a Smart Scale if I Have a Pacemaker? A: It depends on the scale. Most models are completely safe to use with a pacemaker, but you do have to check with the manufacture and the sales page first. Most wireless technology isn’t going to send a jolt from the tempered glass throughout your body. When this issue regarding pacemakers pops up, it’s included in full-body scan machinery that lets off a shock to properly read your body fat content and water weight. Standard smart scales with a tempered glass top won’t affect a pacemaker. Q: What to do When the Scale is Not Connecting to my Smartphone? A: While it could be any number of problems, run down this simple troubleshooting list before contacting the manufacturer regarding their app. Check the batteries in the scale. If they need to be replaced, the Wi-Fi or Bluetooth receiver might not have received enough energy. Restart your phone. Sometimes this just happens with multiple different types of apps. Check for updates. Non-vital apps might be on a setting that places them the low priority for updating, and may not have updated due to storage location issues. Take the batteries out of your scale, and put them back in. Fire it up, and turn on your app to check if this has corrected the problem. Be very close to the scale when you try to connect. If it has been unsynced, this could correct the problem. Q: Can I Use a Smart Scale Without an App? A: You can, but you won’t receive any data or insight into your weight tracking. You can still use the scale to display your weight on the LED or LCD screen, but if you’re not going to use the app, you’d be better off purchasing a simple scale without the added technology and saving yourself some money. Most of these smart scales are configured to work with the app that’s been commissioned by the manufacturer, and very little else. Q: Is There a Minimum Age Limit to Use a Smart Scale? A: If your child’s doctor has determined that they are healthy, there is no reason to track and trend their weight. Until you are at least thirteen years of age, you shouldn’t be weighing yourself daily unless there is a medical reason. A child may operate the scale (most operate at 1 lb or lower), but it isn’t necessary to track any data. Doing so may actually promote negative self-worth and prove confusing when reported to the doctors. Q: What is the Maximum Weight Supported by the Scale? A: Most scales have an average weight limit of 350 lbs, though our top selection has a limit of 400 lbs. Tempered glass can only hold so much weight, and is the most commonly used top plate material in any bathroom scale construction. If you notice, the scales at the doctor's office has aluminum stands that help in self-balancing. Those systems have a lot more working beneath them than simple sensors underneath the glass. Tempered glass is the best material for a home scale, but please be careful not to exceed the limit set by the individual manufacturers. Q: What Surface Can I Operate my Smart Scale on? A: Unlike standard bathroom scales you can buy at the department store, smart scales require a bit more precision. We recommend using them on a hard stone tile floor and ensuring that the floor is completely level before placing it down. If you have a small utility leveler in a toolkit nearby, just test the exact spot before placing it down. Avoid carpet and linoleum, but you’ll be good on tile and hardwood to operate your smart scale. Q: Is the Scale Waterproof? A: Most scales are waterproof, but don’t assume this at the time of purchase. We’ve seen some smart scales (ones that didn’t make this list) where the entire scale was waterproof, except for the battery case housing. That just doesn’t make any sense. Look for seals of 100% waterproofing, and try to find information about submersion. While we hope you aren’t going to put your smart scale in the full bathtub with you, if your bathroom floods for any reason, you want your scale to be operational after the cleanup. Q: How Often Should I Replace my Scale’s Batteries? A: Since smart scales use Wi-FI, (and we know how much the Wi-Fi on our phones eats up our battery), you’re going to burn through it faster. For most models, such as our top pick, you should replace the battery once every six months to ensure it’s working properly. Many fitness scale owners will often stockpile replacement batteries by the half-dozen to prevent shipping times and gaps in the data they receive on their app. If you're sticking to the information you get from your smart scale and using it on a daily basis, getting some additional batteries at checkout is the way to go.